How can I send my emails from more than one sender? When you create a delivery schedule, the sender’s email address can only be an email address that you have first authenticated. Since this could be an email address that you have no access to, you can authenticate it with any other email address of the same domain (the part after @). In other words, if you would like to use the info@business.com as the sender’s email address, but you have access only to the marketing@business.com address, then you can use the marketing@business.com address to authenticate the info@business.com address. In practice, it works the following way: when you are creating a delivery schedule, and you give the sender of the email (e.g. info@business.com), SalesAutopilot checks whether or not you have authenticated that domain. If you have already done that, you won’t have to do it again. However, when you use a domain for the first time as the sender’s email address, then a dialog box will appear when you click the Next button. This will start the email domain authentication process. In the dialog box, give an email address of the domain that you have access to. 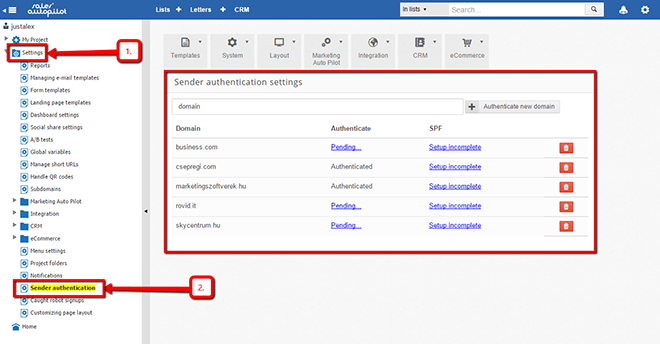 When you click the Send authentication code button, SalesAutopilot will send an authentication code to the email address you provided. You will have to type that code in the dialog box as prompted. After typing in the code, click on the Authentication button . If you typed in the correct code, then the dialog box will disappear, and the next step of editing the delivery schedule will appear. If you didn’t receive the code, you can send it again by clicking the Resend authentication code button. If it still fails to be delivered, contact us. In the future, you will be able use any email address of the domain you have authenticated, without having to authenticate each one. On any user’s page, you can add pre-defined email addresses, and then you can use these by selecting them from a dropdown menu, at the second step of editing your delivery schedule. 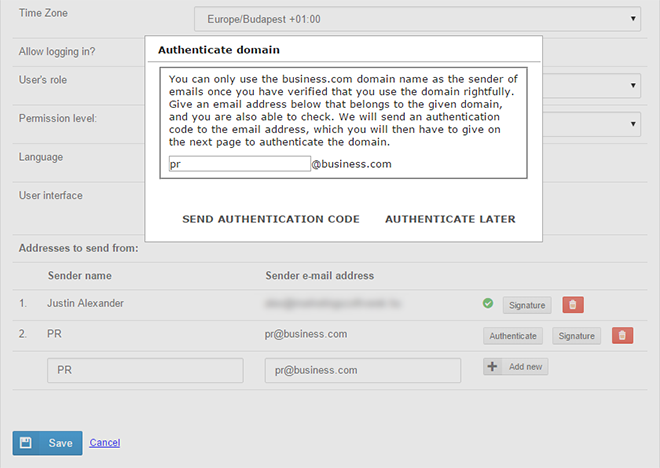 However, only those pre-defined email addresses will appear in the dropdown menu that you have already authenticated. When you create a new user with an email address that you haven’t authenticated yet, then the authentication code sending dialog box will appear. In the dialog box, give the actual email address you have access to, so you could receive the authentication code the software will send you, and then click on the “Send authentication code” button. 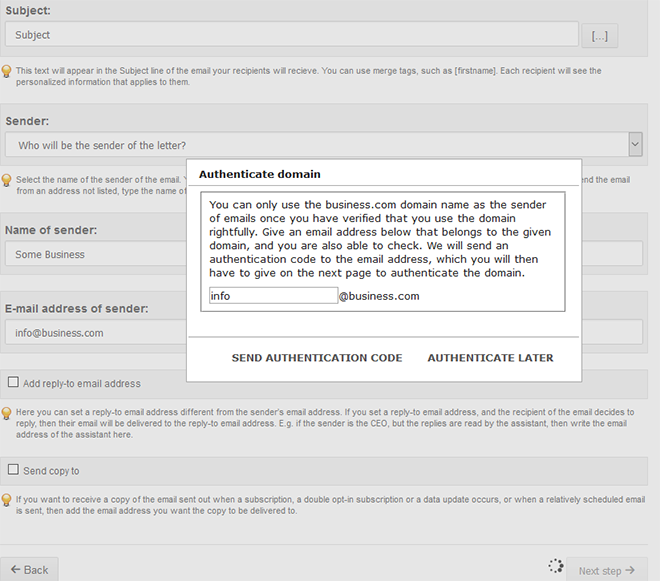 If you would not like to use the given domain for the sender’s email address, click the “Authenticate later” button. You will be able to authenticate an email address’s domain on the Edit user access page, or by going to Settings / Sender authentication in the left menu. Major email clients (Gmail, Yahoo, Facebook) are placing greater and greater emphasis on verifying the authenticity of senders, so they could filter out unathorized users and spam senders who are trying to hide their true identity. They use various methods of verification, such as the DKIM key of emails, the sending server’s SPF record, or the sender’s SPF record. SalesAutopilot automatically places a DKIM in every email, and the domain names of our email sending servers have SPF records. But, only the owner of the domain can set the sender’s SPF record. We recommend that you set your SPF record, to ensure a higher delivery rate. To display the SPF record for the domain that you would like to set it for, click on the “Setup incomplete” link, next to the given domain name. 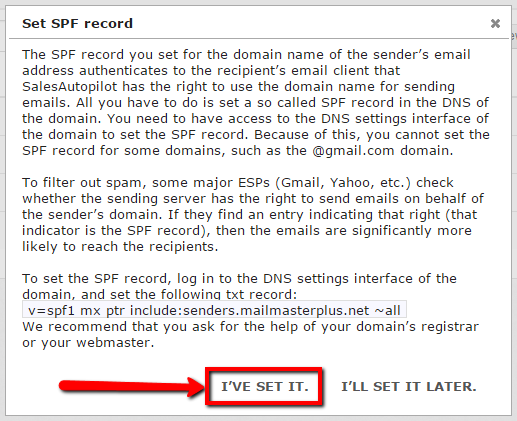 In the dialog box, you will see the instructions you need to set up the SPF record. Briefly put, set the v=spf1 mx ptr include:senders.mailmasterplus.net ~all TXT record for the domain. If you don’t have direct access to the settings of the domain’s DNS records, then you need to ask your registrar or administrator to help you. When you are done with these settings, let us know by clicking the “I’ve set it” button in the dialog box. Click the "I've set it" button after you complete the setup.